and upon clicking close you get a message saying that "this issue cant be reported, please work this issue through technical support channels first"
This seems a little strange as bugs are off topic so why are they redirecting potential bug reports to a channel which does not deal with them? It's not just this. 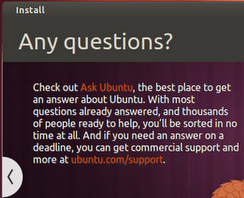 Canonical and the Ubuntu community as a whole are pushing Ask Ubuntu as their default support solution. It may be we've advertised ourselves more stridently than our policy should allow. More importantly, though, it seems other user-facing problem sites have buckled under tech support strain, while Ask Ubuntu is merely shaking, creaking, and throwing splinters in the air. I would suggest to those going to UDS next week: please discuss how Ask Ubuntu can scale up to these new expectations (eg having Apport send information to Ask Ubuntu), or how we can let the rest of Ubuntu know we're not a catch-all. In that text it doesn't say "Report your bugs to Ask Ubuntu", it merely mentions that Ask Ubuntu is a free technical support venue. In the context of the workflow this makes sense since the user selected the field that says "I don't know what to do" indicating they are stuck and require assistance. Most average users don't know that Apport is used for bug reporting. In the end, the user will ask a question - and will either be pointed to the appropriate source, or receive an answer. If you believe the text is misleading the best course of action, almost comically, would be to open a bug against the Apport project explaining your opinions on this item. So the background here is we get tons and tons of "bug reports" filed against X in the stable release which are utterly useless. And most of the time the user is really only looking for a workaround to get their system working again. It's not hard to find a workaround (installing and running the current upstream kernel tends to solve a lot of "X" problems, and there's various kernel parameters to fiddle with). Problem is the reporter loses interest at that point and doesn't follow through with git bisection or whatever, so we can actually fix Ubuntu. Many stable release users expect a quicker response than we generally can provide in Launchpad, and they want to know workarounds ASAP so they can get their system up. They don't want to hear all the technobabble about git bisects and kernel rebuilds. They certainly don't want to invest any more time into it than they have to. So they're not good candidates for bug fixing work. Still, they deserve assistance, it's just that a bug report in Launchpad isn't going to get them what they want. Their report is just going to add to the log jam. And so that is the purpose the above dialog: to try and steer the users to where they are most likely to get some sort of response and guidance with their troubles. Certainly there are plenty of support options out there; problem is that by and large most of them aren't very effective. So, a couple years back I was bellyaching all of the above to Jorge over beers, and how much time I would waste invalidating these useless bug reports. At the time he was very gung ho about AskUbuntu, and so was pushing that. From what he described it sounded like it met these needs way better than Launchpad. Because of the high level of community activity new requests get addressed right away. Because of the voting, you're more likely to get effective answers. Because of the bounty system, users can "pay" to stimulate people to help them. Waaay better than Launchpad or any other support options. I had been putting time into writing up detailed troubleshooting guides in our wiki for things like X freezes, crashes and so on, but no one seems to ever be able to find those docs. Jorge felt that AskUbuntu was much better because it had a way higher google ranking, and people would be better able to find these answers that way. And that is the real answer to why Ask Ubuntu is linked to from the X apport hook. Anyway, now Jorge has asked that xdiagnose not encourage users to use Ask Ubuntu, and since he asked I've removed it. Instead it's just pointing them to a generic support page. I've also provided a "just file the dang bug report" button too. But I can't help but feel this is a step in the wrong direction, and puts us back to where we were. But if Ask Ubuntu is just marking the questions invalid too, that's hardly helping anyone so it's pointless to direct people here. 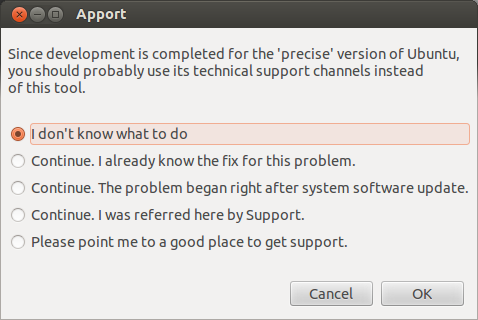 My original hope was not that Ask Ubuntu would be fielding bugs, but rather that it would translate them into a question like "How do I properly diagnose and report a problem with ___" and answer that, and then dupe all the incoming Q's there. Or at least point people to the X troubleshooting guides in wiki. Or even coming up with some spiffy hybrid solution that better leverages the strengths of Ask Ubuntu, Apport, and Launchpad towards actually getting these issues sorted out. This is probably also the cause why so many questions show so little effort at trying to find an answer from a search machine. This ended up being a problem in the xdiagnose hook. It has been fixed so AU won't be mentioned when something crashes. It's in -proposed now and will be pushed out as an update in probably a week or so. If someone can try Scott's recommendation in the comment to test that it works that would be appreciated, I could never get this dialog to come up in the first place.